Nora goes tomorrow morning for her swallow study. PLEASE continue to pray that that all goes well. I’m a little on edge about that, always fearful that I’m going to hear something that makes my blood run cold. I need to go back and read some of the previous posts I’ve written about worry, and feeling victimized. It’s so stupidly easy to fall back into that fruitless mode of thinking. I will admit, I haven’t been the easiest or nicest person to live with these past couple of days. The existing layer of stress infused with a maelstrom of hormonal issues does not bring out the very best in me. Even though I was probably the furthest thing from humble and gentle today (except when I was sleeping) – my dear sweet, beloved, exceptional, amazing, precious husband has been nothing but patient with me, making allowances for my many faults because of his obvious love. William, you are a true man of faith not only in your words, but your actions. I love you. I love you. I love you. You’re an amazing husband and Daddy and I’m sorry if I made you feel otherwise. Praying for you and Nora. Totally understand the hormone, swaying faith, edgy-ness, sudden grips of fear, and not so humble/gentle thing! ….and the great news is – so does Jesus 🙂 Promise. HI ALEISA, AS I WAS READING YOUR BLOG, I WAS THINKING “YOUR FAMILY UNDERSTANDS”. BEFORE I GOT DONE READING, I SAW WHAT YOU WROTE ABOUT WILLIAM. JUST AS I THOUGHT HE WOULD BE. I DON’T KNOW HIM, BUT I FEEL LIKE I DO. AT THAT THOUGHT, I HAVE TO SAY HE WILL ALWAYS BE THERE FOR YOU AND WILL ALWAYS UNDERSTAND. THAT IS HOW MY HUSBAND OF 48 YEARS (IN OCTOBER) IS ALSO. WE ARE LUCKY LADIES TO HAVE SUCH WONDERFUL HUSBANDS AND FAMILIES. SENDING UP PRAYERS A LOT TODAY FOR LITTLE NORA’S APPOINTMENT. SHE IS DOING SO GOOD, AND I FEEL AS THOUGH THAT IS A GOOD SIGN FROM GOD. TRY TO GET SOME REST TONIGHT, SO YOU WILL BE RESTED UP FOR TOMORROW. THERE ARE A LOT OF PEOPLE WHO WILL BE PRAYING FOR YOU AND YOUR FAMILY TOMORROW. LOVE AND PRAYERS. GOOD NIGHT AND GOD BLESS. Prayers for your family today!! Don’t be fearful, sweet Leis! Whatever the outcome, it has it’s purpose. You didn’t know that with Nora’s original diagnosis, you didn’t know it with each blow along the way, yet somehow, in God’s infinite mercy and love, He showed you the beauty in all things that were originally hard or seemingly “devastating”. You don’t know what this morning will bring, but He does. It may be awesome news… and so He is telling you “DO NOT WORRY!” It may not be what you want to hear or think you can handle, but again, He is saying “DO NOT WORRY!” Go back to your blog entry titled “Tightrope”. Steady, girl… as always, He’s got this! I hope you get some answers, my friend. If I can help, I am a phone call away. Your strength and faith are amazing-praying for you all, as always! So good to see you yesterday. Prayers and heart going out to you today, and Nora’s little swallow/lung parts…hoping that you find peace in your own words that have given so many of us peace. Good thing God gave our husbands (sorry, hubsbindzs) the ability to give grace or we would all be up the creek! Some Jesus Calling for today….Jan 19, Jan 31, Feb 15, Feb 27, March 16, April 2, April 15, June 7…and thanks for having me look for those. Still watching and praying from afar. If you or William need anything, he knows my number. Call any time! Praying for Nora and the swallow study today, feel our prayers? I know what it feels like to have a great, loving husband and many, many ladies go their whole lives without being able to know and experience that. God bless you for knowing what you have and loving him back so much! I hope date nights are possible in the future, they make all the difference in the world!!!!! All of our love and support as you care for all of your family. You are doing a great job, and inspiring the world with your unmovable faith, unending determination and soft, sweet love. We are all right here for you!!! Praying for sweet Nora today. Our daughter had her third swallow study last Thursday. Put your trust in the doctors, therapists, radiologists and most of all, God. They all have it under control- all you have to do is show up with that sweet girl. He has placed all these people in Nora’s path today as the best ones to diagnose and treat whatever they might see on the scan. Best wishes from Nora’s fans in Arkansas! Can’t wait to hear a great report! Either pray or worry… Don’t do both. Aleisa- You are only human!! We all do it, but most of us do not have the stress that you have. You are a true inspiration and have made me a better person just by reading your blog and seeing how you have been able to see that God has a plan for everyone…may not be the one we had in mind for ourselves but one we should embrace and learn to accept. May God give you the strength to carry on, love to bestow on Nora, your family and friends and patience to understand this path you are embarking on. Hugs for you! PS…Nora makes me smile everytime I see your cute little face in the pictures that you post. I DON’T KNOW HOW I MISSED THE BEAUTIFUL GIRLS PICTURE. 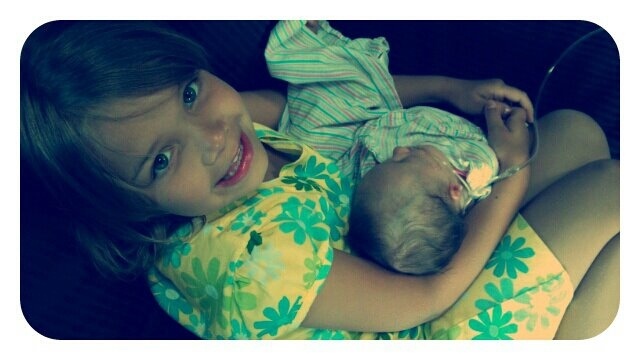 GRETA HAS TO BE THE BEST BIG SISTER. I CAN SEE THE LOVE IN THOSE BEAUTIFUL EYES THAT SHE HAS FOR HER BABY SISITER. WAY TO GO GRETA. You and little Nora are such an inspiration! Thank you for sharing your story!